The Evolis Full Color Ribbon for the Zenius - YMCKO - 200 Prints (item#: R5F002AAA) is ideal to print vibrant ID cards and badges on demand. The YMC (Yellow, Magenta, cyan) panels will create stunning color images while the Black (K) panel will print sharp text or barcodes. The Overlay (O) panel will protect your cards from wear and tear and extend the lifespan of your cards. 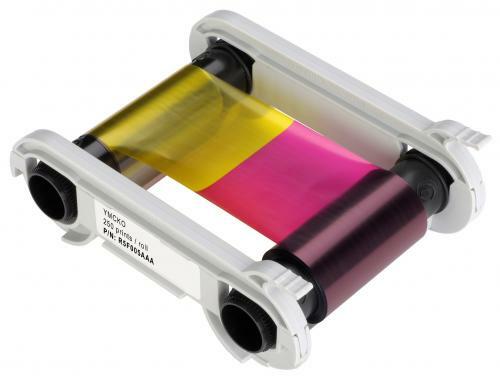 This high-capacity ribbon offers 200 images per ribbonto increase your card production rate and therefore maximize productivity. The Evolis full color YMCKO ribbon comes in a cartridge that simply drops into your Evolis Zenius printer. 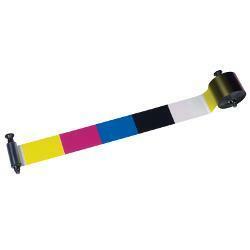 Monitoring of remaining ribbon capacity is easy with on-screen display alerts when the ribbon is nearing its end. This ribbon is also eco-friendly: its packaging and core are made of recycled material. This Evolis full color YMCKO ribbon is for use with the Zenius card printers. Genuine Evolis supplies meet stringent quality standards and are recommended for optimal printing quality and proper printer performance.